This creamy dish is really satisfying, but surprisingly low in calories. Each serving provides 391 kcal, 58g protein, 10.5g carbohydrate (of which 7g sugars), 11.5g fat (of which 6g saturates), 7.5g fibre and 1.1g salt. Heat the spray oil in a non-stick frying pan, add the chicken breasts and fry for about 10 minutes, or until well browned on both sides. Set aside. In the same pan, add a little more oil and fry the onion for 2-3 minutes, or until translucent. Add the garlic and fry for another 1-2 minutes. Add the mushrooms and fry until golden-brown. If they start to stick, add a little stock to the pan. 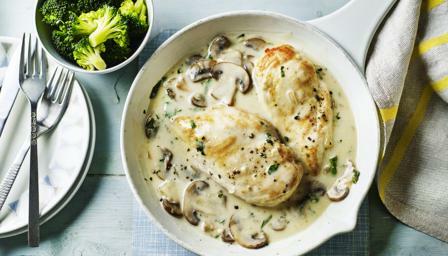 Stir the crème fraîche and parsley into the sauce and serve immediately with the broccoli.